This document answers frequently asked questions about billing chronic care management (CCM) services to the Physician Fee Schedule (PFS) and Hospital Outpatient Prospective Payment System (OPPS) under CPT code 99490. 1. CPT code 99490 requires at least 20 minutes of time per calendar month by “clinical staff” in order to bill the code. Who qualifies as “clinical staff”? If the billing physician (or other appropriate practitioner) furnishes services directly, does their time count towards the required minimum 20 minutes of time? In most cases, we believe clinical staff will provide CCM services incident to the services of the billing physician (or other appropriate practitioner who can be a physician assistant, nurse practitioner, clinical nurse specialist or certified nurse midwife). Practitioners should consult the CPT definition of the term “clinical staff.” In addition, time spent by clinical staff may only be counted if Medicare’s “incident to” rules are met such as supervision, applicable State law, licensure and scope of practice. If the billing physician (or other appropriate billing practitioner) provides CCM services directly, that time counts towards the 20 minute minimum time. Of course, other staff may help facilitate CCM services, but only time spent by clinical staff may be counted towards the 20 minute minimum time. 2. Can CCM services be subcontracted out to a case management company? What if the clinical staff employed by the case management company are located outside of the United States? A billing physician (or other appropriate practitioner) may arrange to have CCM services provided by clinical staff external to the practice (for example, in a case management company) if all of the “incident to” and other rules for billing CCM to the PFS are met. Because there is a regulatory prohibition against payment for non-emergency Medicare services furnished outside of the United States (42 CFR 411.9), CCM services cannot be billed if they are provided to patients or by individuals located outside of the United States. 3. Does the billing practice have to furnish every scope of service element in a given service period, even those that may not apply to an individual patient? It is our expectation that all of the scope of service elements will be routinely provided in a given service period, unless a particular service is not medically indicated or necessary (for example, the beneficiary has no hospital admissions that month so there is no management of a transition after hospital discharge). 4. What date of service should be used on the physician claim and when should the claim be submitted? The service period for CPT 99490 is one calendar month, and CMS expects the billing practitioner to continue furnishing services during a given month as applicable after the 20 minute time threshold to bill the service is met (see #3 above). However practitioners may bill the PFS at the conclusion of the service period or after completion of at least 20 minutes of qualifying services for the service period. When the 20 minute threshold to bill is met, the practitioner may choose that date as the date of service, and need not hold the claim until the end of the month. 5. What place of service (POS) should be reported on the physician claim? Practitioners must report the POS for the billing location (i.e., where the billing practitioner would furnish a face–to-face office visit with the patient). Accordingly, practitioners who furnish CCM in the hospital outpatient setting, including provider-based locations, must report the appropriate place of service for the hospital outpatient setting). Payment for CCM furnished and billed by a practitioner in a facility setting will trigger PFS payment at the facility rate. If the patient resides in a community setting and the CCM service is provided by or “incident to” services of the billing physician (or other appropriate billing practitioner) working in or employed by a hospital, CPT 99490 can be billed to the PFS and payment is made at the facility rate (if all other billing requirements are met). We discuss this further under the section below addressing billing for CCM furnished in the hospital outpatient department setting. As we discussed in the CY 2014 PFS final rule, the resources required to provide care management services to patients in facility settings significantly overlap with care management activities by facility staff that are included in the associated facility payment. Therefore, CPT 99490 cannot be billed to the PFS for patients who reside in a facility (that receives payment from Medicare for care of that beneficiary, see 78 FR 74423) regardless of the location of the billing practitioner, because the payment made to the facility under other payment systems includes care management and coordination. For example, CPT code 99490 cannot be billed to the PFS for services provided to SNF inpatients or hospital inpatients in Medicare Part A covered stays, because the facility is being paid under Part A for extensive care planning and care coordination services. However if such patients are not inpatients the entire month, time that is spent furnishing CCM services to the patient while they are not inpatient can be counted towards the minimum 20 minutes of service time that is required to bill CCM for that month. See #7 below for more information. Billing practitioners in hospital-owned outpatient practices that are not provider-based departments are working in a non-facility setting, and may therefore bill CPT 99490 and be paid under the PFS at the non-facility rate. However, CPT 99490 can only be billed for CCM services furnished to a patient who is not a hospital or SNF inpatient and does not reside in a facility that receives payment from Medicare for that beneficiary. 7. Can I bill CPT 99490 for CCM services provided to beneficiaries in skilled nursing facilities, nursing facilities or assisted living facilities? If all the CCM billing requirements are met and the facility is not receiving payment for care management services (for example, the beneficiary is not in a Medicare Part A covered stay), practitioners may bill CPT 99490 for CCM services furnished to beneficiaries in skilled nursing facilities, nursing facilities or assisted living facilities. The place of service (POS) on the claim should be the billing location (i.e., where the billing practitioner would furnish a face–to-face office visit with the patient) as per #5 above. 8. Is a new patient consent form required each calendar month or annually? No, as provided in the CY 2014 PFS final rule (78 FR 74424), a new consent is only required if the patient changes billing practitioners, in which case a new consent must be obtained and documented by the new billing practitioner prior to furnishing the service. 9. Is Medicare now paying separately under the PFS for remote patient monitoring services described by CPT code 99091 or similar CPT codes? CPT 99091 continues to be bundled with other services for payment under the PFS. As per CPT guidance, CPT codes 99090, 99091 and other codes cannot be billed during the same service period as CPT 99490. However as discussed in the CY 2015 PFS final rule (79 FR 67727), analysis of patient–generated health data and other activities described by CPT 99091 or similar codes may be within the scope of CCM services, in which case these activities would count towards the minimum 20 minutes of qualifying care per month that are required to bill CPT 99490. But in order to bill CPT 99490, such activity cannot be the only work that is done—all other requirements for billing CPT 99490 must be met in order to bill the code, and time counted towards billing CPT 99490 cannot also be counted towards billing other codes. 10. If a physician arranges to furnish CCM services to his/her patients “incident to” using a case management entity outside the billing practice, does the billing physician need to ever see the patient face-to-face? Yes, as provided in the CY 2014 final rule (78 FR 74425), CCM must be initiated by the billing practitioner during a “comprehensive” Evaluation & Management (E/M) visit, annual wellness visit (AWV) or initial preventive physical exam (IPPE). This face-to-face visit is not part of the CCM service and can be separately billed to the PFS, but is required before CCM services can be provided directly or under other arrangements. The billing practitioner must discuss CCM with the patient at this visit. While informed patient consent does not have to be obtained during this visit, it is an opportunity to obtain the required consent. The face-to-face visit included in transitional care management (TCM) services (CPT 99495 and 99496) qualifies as a “comprehensive” visit for CCM initiation. Levels 2 through 5 E/M visits (CPT 99212 through 99215) also qualify; CMS is not requiring the practice to initiate CCM during a level 4 or 5 E/M visit. However CPT codes that do not involve a face-to-face visit by the billing practitioner or are not separately payable by Medicare (such as CPT 99211, anticoagulant management, online services, telephone and other E/M services) do not meet the requirement for the visit that must occur before CCM services are furnished. If the practitioner furnishes a “comprehensive” E/M, AWV, or IPPE and does not discuss CCM with the patient at that visit, that visit cannot count as the initiating visit for CCM. 11. Do face-to-face activities count as billable time? CPT 99490 describes activities that are not typically or ordinarily furnished face–to–face, such as telephone communication, review of medical records and test results, and consultation and exchange of health information with other providers. If these activities are occasionally provided by clinical staff face–to-face with the patient but would ordinarily be furnished non-face–to-face, the time may be counted towards the 20 minute minimum to bill CPT 99490. However, see #12 below regarding care coordination services furnished on the same day as an E/M visit. 12. Medicare and CPT allow billing of E/M visits during the same service period as CPT 99490. If an E/M visit or other E/M service is furnished the same day as CCM services, how do I allocate the total time between CPT 99490 and the other E/M code(s)? Under longstanding Medicare guidance, only one E/M service can be billed per day unless the conditions are met for use of modifier -25. Time cannot be counted twice, whether it is face-to-face or non-face–to-face time, and Medicare and CPT specify certain codes that cannot be billed for the same service period as CPT 99490 (see #13, 14 below). Face–to-face time that would otherwise be considered part of the E/M service that was furnished cannot be counted towards CPT 99490. Time spent by clinical staff providing non-face–to-face services within the scope of the CCM service can be counted towards CPT 99490. If both an E/M and the CCM code are billed on the same day, modifier -25 must be reported on the CCM claim. 13. Medicare and CPT specify that CCM and TCM cannot be billed during the same month. Does this mean that if the 30-day TCM service period ends during a given calendar month and 20 minutes of qualifying CCM services are subsequently provided on the remaining days of that calendar month, CPT code 99490 cannot be billed that month to the PFS? CPT 99490 could be billed to the PFS during the same calendar month as TCM, if the TCM service period ends before the end of a given calendar month and at least 20 minutes of qualifying CCM services are subsequently provided during that month. However we expect that the majority of the time, CCM and TCM will not be billed during the same calendar month. 14. Are there any other services that cannot be billed under the PFS during the same calendar month as CPT 99490? Yes, Medicare does not allow CPT 99490 to be billed during the same service period as home health care supervision (HCPCS G0181), hospice care supervision (HCPCS G0182) or certain ESRD services (CPT 90951-90970) because care management is an integral part of all of these services. Also see CPT coding guidance for a list of additional codes that cannot be billed during the same month as CPT 99490. There may be additional restrictions on billing for practitioners participating in a CMS model or demonstration program; if you participate in one of these separate initiatives, please consult the CMS staff responsible for these initiatives with any questions on potentially duplicative billing. 15. Can I bill CPT 99490 if the beneficiary dies during the service period? CPT 99490 can be billed if the beneficiary dies during the service period, as long as at least 20 minutes of qualifying services were furnished during that calendar month and all other billing requirements are met. 16. Will practitioners be able to use an acceptably certified electronic health record (EHR) technology for which certification expires mid-year in order to bill for CCM? For example, can they use technology certified to the 2011 Edition to fulfill the scope of services required to bill CPT 99490 in 2015 once this technology no longer bears a “2011 Edition certified” mark? Yes. Under the CCM scope of services, practitioners must use technology certified to the Edition(s) of certification criteria that is acceptable for the EHR Incentive Programs as of December 31st of the year preceding each CCM payment year. In certain years, this may mean that practitioners can fulfill the scope of services requirement using multiple Editions of certification criteria. For instance, for payment in 2015, practitioners may use technology certified to either the 2011 or 2014 Edition of certification criteria to meet the EHR scope of service requirements, as both Editions could be used to meet the requirements of the EHR Incentive Programs as of December 31, 2014. This remains true for a given PFS payment year even after ONC-Authorized Certification Bodies (ONC-ACBs) have removed the certifications issued to technology certified to a given acceptable edition (e.g., the 2011 Edition for CCM payment in 2015) as a result of the relevant criteria being removed from the Code of Federal Regulations. Thus, practitioners using an acceptable EHR technology that loses its certification mid-year may still use that technology to fulfill the certified EHR criteria for billing CPT 99490 during the applicable payment year. 17. If my practice (the billing practice) has the ability to send clinical summaries or the electronic care plan via an acceptable electronic technology other than fax, but the receiving practice/provider (which is not billing for CCM services) can only receive the required information via fax, can the billing practice fax the information and still meet the transmission requirements for billing CPT 99490? CMS does not require practitioners to use a specific tool or service to communicate clinical summaries in managing care transitions, as long as practitioners transmit the clinical summaries electronically, with the exception of faxing. We are clarifying that a practitioner may satisfy the CCM scope of service element around transitions of care if the practitioner electronically transmits a summary to a third party provider, and this summary of care is then transmitted to the receiving practitioner/provider through another method, including fax. This policy is consistent with guidance that CMS has previously issued with regards to meeting the transitions of care objectives within the EHR Incentive Programs, available at: https://questions.cms.gov/faq.php?faqId=10660. Regarding the requirement to electronically transmit care plan information other than by fax, we expect that some practitioners may transmit care plan information as part of the structured clinical summary. We remind practitioners that alternative secure methods of sending electronically such as HIPAA compliant encrypted email are also acceptable. However in those instances where the receiving practitioner/provider (who is not billing for CCM) is only able to receive care plan information electronically by fax, the care plan information may be directly transmitted via fax. We may reconsider these provisions in the future as the interoperability of electronic health records increases. 18. Does the Medicare Access and CHIP Reauthorization Act of 2015 (MACRA, P.L. 114-10) affect the billing rules for CCM services? No, Section 103 of the MACRA codifies payment broadly for chronic care management services under the PFS, authorizing PFS payment after January 1, 2015, for CCM services furnished by physicians and the non-physician practitioners that Medicare generally recognizes to furnish and bill for E/M services (physician assistants, nurse practitioners, clinical nurse specialists and certified nurse midwives). It does not impact the current billing and payment rules for CPT 99490. It provides that provision of an AWV or IPPE in advance shall not be a condition of payment for CCM services, which is consistent with our current policy. It also provides that payment shall not be duplicative of other Medicare payments, consistent with the rules we have implemented to date regarding duplicative payment for CPT 99490. 19. If a beneficiary declines to receive CCM services or does not provide consent, or if other conditions of payment for CPT 99490 are not met, can the practitioner bill the beneficiary? No, the beneficiary must provide the required consent and all other Medicare conditions of payment must be met in order to bill Medicare or the beneficiary for CPT 99490. If the beneficiary does not provide consent or if other conditions for payment are not met, the practitioner cannot bill Medicare or the beneficiary for CPT 99490. Medicare would consider any CCM services furnished to the beneficiary as included in payment for the face–to- face visit(s) furnished to the beneficiary. As we noted in the CY 2014 PFS final rule with comment period (78 FR 74414-74415), payment for non- face–to-face care management services was previously bundled into payment for face–to-face visits, and we did not revalue these visits under the PFS to account for separate payment of CCM services. We also note that CPT 99490 would be considered a reasonable and necessary covered Medicare service, so it would not be appropriate to issue the beneficiary an Advance Beneficiary Notice of Noncoverage (ABN). 20. If I provided more than 20 minutes of CCM services, can I bill more than one unit or more than one line item of CPT 99490 in the service period to account for this time? This CPT code describes a minimum number of minutes of service (there is no maximum). Therefore, the practitioner may only bill one unit and one line item of CPT 99490 per calendar month. Also only one practitioner can bill CPT 99490 per service period. 21. Where can I find more guidance on CCM billing requirements? A Fact Sheet on CCM is available on the CMS website at http://www.cms.gov/Outreach-and– Education/Medicare–Learning–Network- MLN/MLNProducts/Downloads/ChronicCareManagement.pdf. 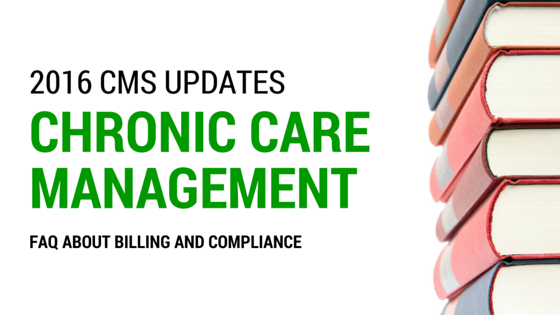 The scope of service elements and other requirements for billing CCM to the PFS are also laid out in the CY 2014 and CY 2015 PFS final rules (CMS-1600-FC, CMS-1612-FC and CMS-1612-F2, available on the CMS website at http://www.cms.gov/Medicare/Medicare–Fee–for-Service–Payment/PhysicianFeeSched/PFS-Federal– Regulation–Notices.html). Most of the requirements were finalized in the CY 2014 PFS final rule, effective CY 2015. The CY 2015 final rule with comment period and correction notice address supervision and other “incident to” rules, electronic health record and other electronic technology requirements, valuation, and intersection with CMS’ care coordination models and demonstrations. Regarding the intersection with CMS’ care coordination models and demonstrations, please consult the CMS staff responsible for those projects. You may also direct questions to your Medicare Administrative Contractor. 22. Are hospital outpatient departments (HOPDs) eligible to bill CPT code 99490 under the OPPS? Yes, CPT code 99490 is payable under the OPPS when certain requirements are met (see details in question #23 on billing requirements). As CPT code 99490 is defined as a physician-directed service, the OPPS provides payment to the HOPD when the hospital’s clinical staff furnishes the service at the direction of the physician (or other appropriate practitioner). Payment under the OPPS represents only payment for the facility portion of the service. Payment for the physician’s (or other appropriate practitioner’s) time directing CCM services in the HOPD setting is made under the PFS at the facility rate. 23. What are the requirements to bill CCM under the OPPS? CPT code 99490 is a physician-directed service that is only payable under the OPPS when the hospital’s clinical staff furnishes the service at the direction of the physician (or other appropriate practitioner). The billing physician or practitioner directing the CCM services must meet the requirements to bill CCM services under the PFS, when the CCM service is furnished in the physician office or the hospital outpatient department. A Fact Sheet on CCM including requirements to bill CCM services to the PFS is available on the CMS website at http://www.cms.gov/Outreach- and-Education/Medicare-Learning–Network- MLN/MLNProducts/Downloads/ChronicCareManagement.pdf. • Patient Eligibility—Patient has multiple (two or more) chronic conditions expected to last at least 12 months or until the death of the patient, and that place the patient at significant risk of death, acute exacerbation/decompensation, or functional decline. • Patient Agreement— Patient consent to receive CCM services has been obtained by the practitioner and documented in the medical record. • CCM Scope of Service Elements including Structured Data Reporting, Care Plan, Access to Care, and Care Management of the patient are furnished by the hospital. The full listing of required CCM Scope of Service Elements is located in the CY 2014 and CY 2015 PFS final rules (CMS-1600-FC, CMS-1612-FC and CMS-1612-F2, available on the CMS website at http://www.cms.gov/Medicare/Medicare–Fee–for-Service–Payment/PhysicianFeeSched/PFS-Federal– Regulation–Notices.html). • Hospital furnished the CCM services using a version of certified EHR that is acceptable under the EHR Incentive Programs as of December 31st of the calendar year preceding each Medicare PFS payment year (referred to as “CCM certified technology”). The hospital must also meet the requirements to use electronic technology in providing CCM services that are required for payment under the Physician Fee Schedule, such as 24/7 access to the care plan, and electronic sharing of the care plan and clinical summaries other than by fax. 24. How does CMS define a “hospital outpatient” for whom a hospital may bill CCM services (CPT code 99490)? Per section 20.2 of publication 100-04 of the Medicare Claims Processing Manual, a hospital outpatient is a person who has not been admitted by the hospital as an inpatient but is registered on the hospital records as an outpatient and receives services (rather than supplies alone) from the hospital. Since CPT code 99490 will ordinarily be performed non face–to-face (see # 11 above), the patient will typically not be a registered outpatient when receiving the service. In order to bill for the service, the hospital’s clinical staff must provide at least 20 minutes of CCM services under the direction of the billing physician or practitioner. Because the beneficiary has a direct relationship with the billing physician or practitioner directing the CCM service, we would expect a beneficiary to be informed that the hospital would be performing care management services under their physician or other practitioner’s direction. 25. When CCM services are furnished by a physician in a hospital outpatient department, can the physician and the hospital both bill Medicare for the CCM service? Yes, when certain conditions are met. Specifically, when CCM services are furnished by a physician in a hospital outpatient department to an eligible patient, the physician may bill Medicare for CPT code 99490 under the PFS reporting place of service (POS) 22 (outpatient hospital), which will indicate that PFS payment should be made at the facility rate, and the hospital may bill for CPT code 99490 under the OPPS. 26. Can more than one hospital bill and be paid for furnishing CCM services if the patient has been a registered hospital outpatient at more than one hospital over a 12 month span? If only one hospital can bill and receive payment for CCM services, which hospital is allowed to bill? CPT code 99490 is only payable under the OPPS when the hospital’s clinical staff furnishes the CCM service at the direction of a qualified physician (or other appropriate practitioner). As only one physician or practitioner is allowed to bill under the PFS for CPT 99490 during a calendar month service period, accordingly, only one hospital is allowed to bill and be paid for CPT code 99490 for a particular beneficiary during a calendar month service period. We would expect the hospital billing for CPT code 99490 under physician direction to have access to the patient’s consent to receive CCM services documented in the patient’s medical record. The patient may choose a different practitioner to furnish CCM at the conclusion of the service period, at which time the practitioner assuming the provision of CCM services will be required to have the patient consent of CCM services documented in the patient’s medical record. New patient consent is only required if the patient chooses a new practitioner to furnish CCM services, in which case a new consent must be documented in the patient’s medical record prior to furnishing the service. 27. Is CPT code 99490 payable to provider–based hospital outpatient departments under the hospital Outpatient Prospective Payment System (OPPS)? May a hospital-owned practice that is not provider–based bill the OPPS for CCM services? A provider-based outpatient department of a hospital is part of the hospital and therefore may bill for CCM services furnished to eligible patients, provided that it meets all applicable requirements. A hospital-owned practice that is not provider-based to a hospital is not part of the hospital and, therefore, not eligible to bill for services under the OPPS; but the physician (or other qualifying practitioner) practicing in the hospital-owned practice may bill under the PFS for CCM services furnished to eligible patients, provided all PFS billing requirements are met. 28. What is the supervision level for CCM services furnished in the hospital setting? CPT code 99490 is assigned a general supervision level under the OPPS when furnished in the hospital setting. General supervision means the procedure is furnished under the physician‘s overall direction and control, but the physician‘s presence is not required during the performance of the procedure. Under general supervision, the training of the non-physician personnel who actually perform the procedure and the maintenance of the necessary equipment and supplies are the continuing responsibility of the physician. 29. If a beneficiary declines to receive CCM services or does not provide consent, or if other conditions of payment for CPT 99490 are not met, can the hospital bill the beneficiary? No, the beneficiary must provide the required consent and all other Medicare conditions of payment must be met in order to bill Medicare or the beneficiary for CPT 99490. If the beneficiary does not provide consent or if other conditions for payment are not met, the hospital cannot bill Medicare or the beneficiary for CPT 99490. Medicare would consider any CCM services furnished to the beneficiary as included in payment for the face–to- face visit(s) furnished to the beneficiary. We also note that CPT 99490 would be considered a reasonable and necessary covered Medicare service, so it would not be appropriate to issue the beneficiary a Hospital Issued Notice of Noncoverage (HINN). 30. If the hospital provided more than 20 minutes of CCM services, can the hospital bill more than one unit or more than one line item of CPT 99490 in the service period to account for this time? This CPT code describes a minimum number of minutes of service (there is no maximum). Therefore, the hospital may only bill one unit and one line item of CPT 99490 per calendar month.